Last weekend the last stage of the front walk project was completed. Every stone had to be leveled and the gaps between stones filled in. 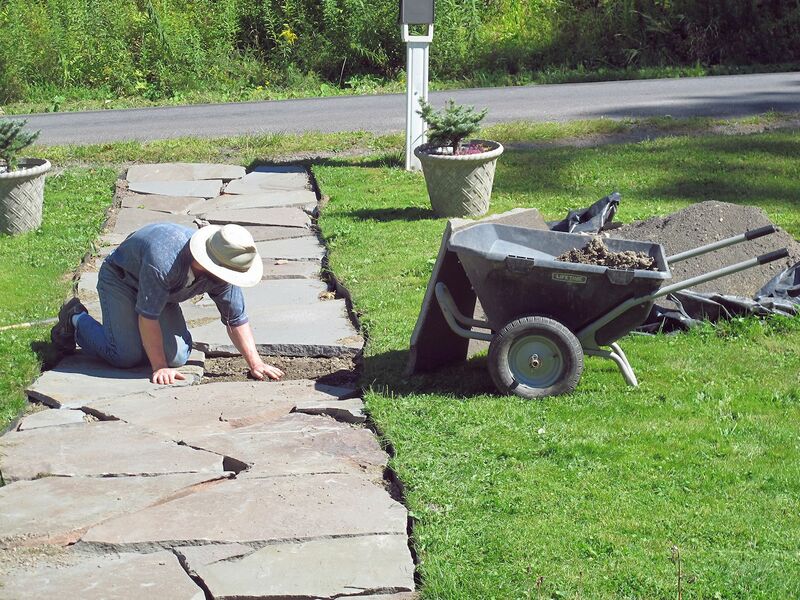 First remove a paving stone that needs to be leveled. 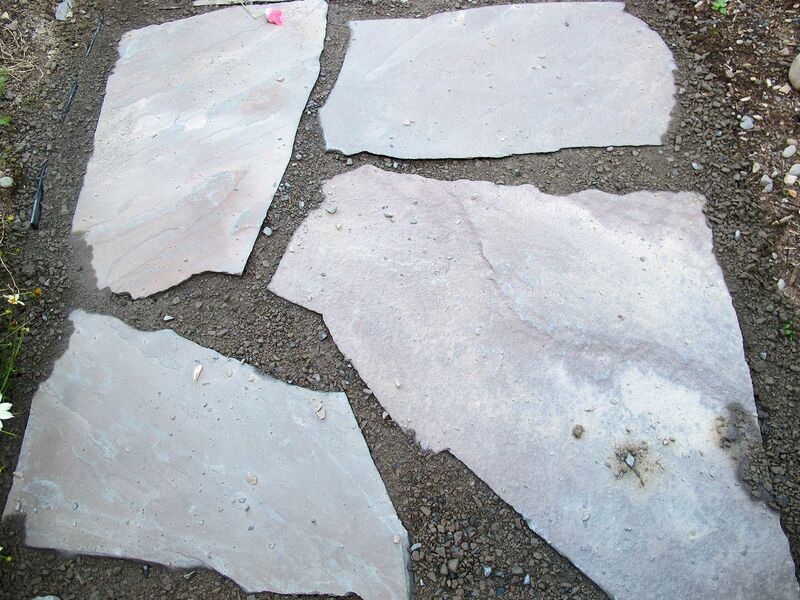 Add crushed bluestone to the space where the paving stone used to be. Distribute the crushed stone so that when you place the large stone on top, it is level with the stones around it. 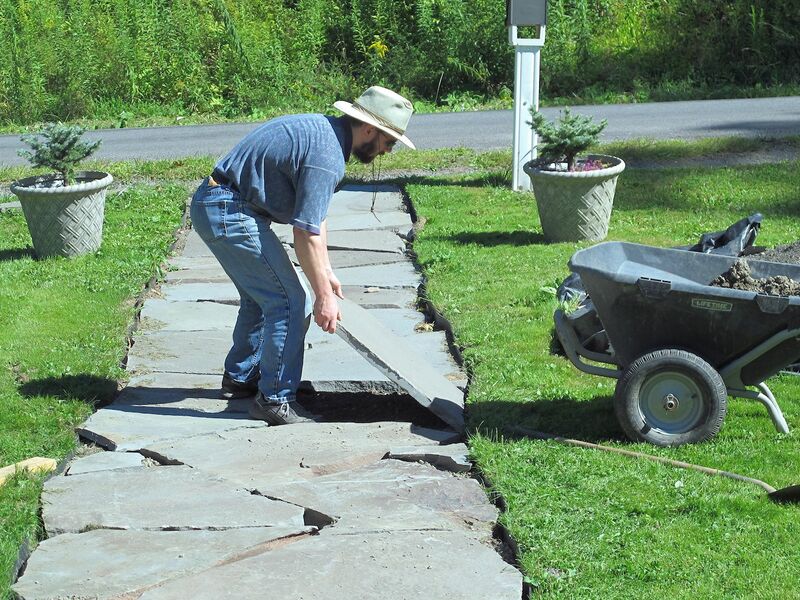 Check to make sure the stone is level with its neighbors. 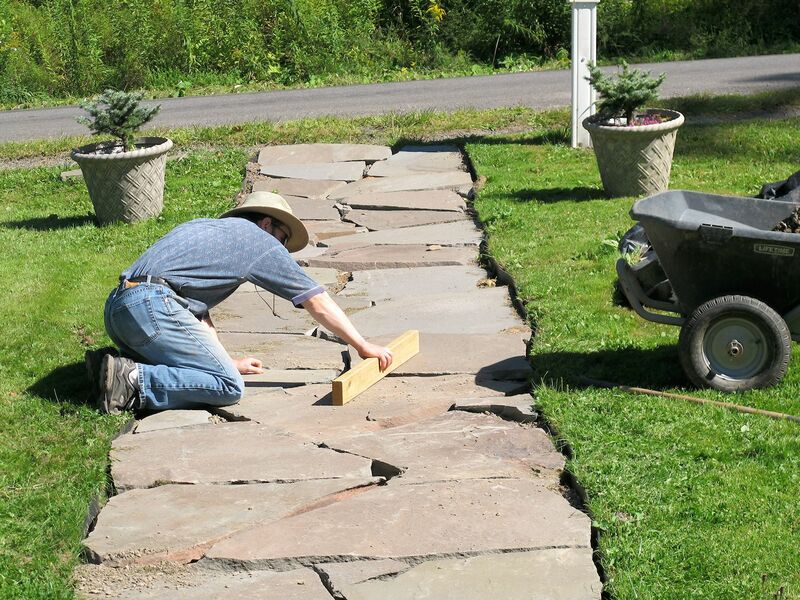 Finally, shovel the same crushed bluestone onto the walk, and sweep it into the cracks. Here you can see how the crushed bluestone fills in the joints. I’d say it’s one swell birthday present! 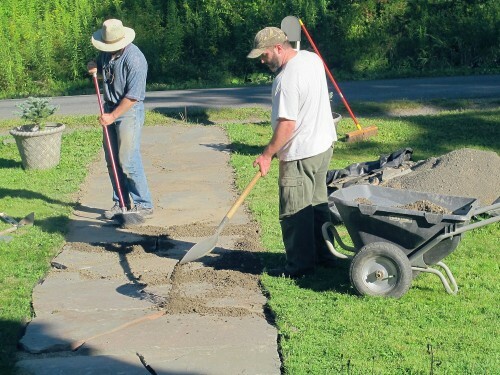 In case you missed my earlier posts about the creation of our new front walk, I’ve listed them here for your convenience. The Front Walk: It’s Coming! 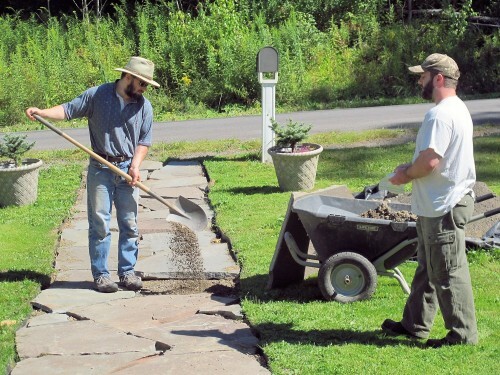 The Front Walk: Excavation Begins! Don’t forget to take my reader survey if you haven’t already done so. It will help me decide what to write about in the next twelve months. The survey is limited to the first 99 respondents and will close on September 19th. Only 31 readers have answered so far and I’d love to hear from 99! I really appreciate you helping me out. Nice and wide — perfect for those big stones. Now that they’re finished, I have a few tasks for your boys. Beautiful walkway! I am still bummed about just missing out on some free flat rocks. By the time I rounded up my husband to help me (lift and load), and we drove back to the location where I spotted them, a man was loading the last rock into the back of his car. I love rocks and love your walkway. I think the crushed stone will work better as a filler for you. Sand has a way of shifting I would think. Love how this came out – it looks so nice! They did an excellent job, Kathy! Kathy this looks gorgeous….a real focal point!! 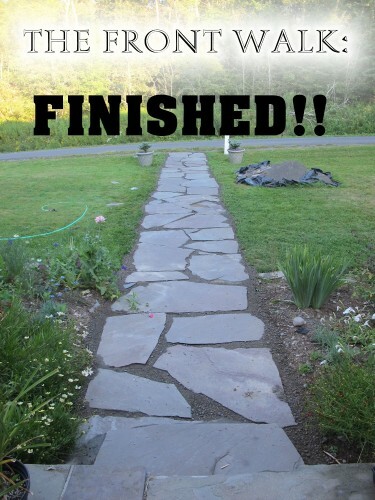 Great job and I think that it meshes well with the house and gardens! Happy Finished Birthday! Congratulations! Getting the mail from your mailbox will be so much more pleasant after a job well done. A beautiful walk, and what wonderful sons you have to lay the stone! You have to be very proud of them all! Thanks for “walking” us through the design and build! Beautiful! Great sons, you have. You will feel the love every time you walk on it. I LOVE those stones. That walkway is beautiful! Very nice! But I bet your sons had sore backs, those look very heavy! Beautiful result…Love the how-to DIY photos. That looks just fantastic — great proportions. You must be very pleased! This looks amazing! 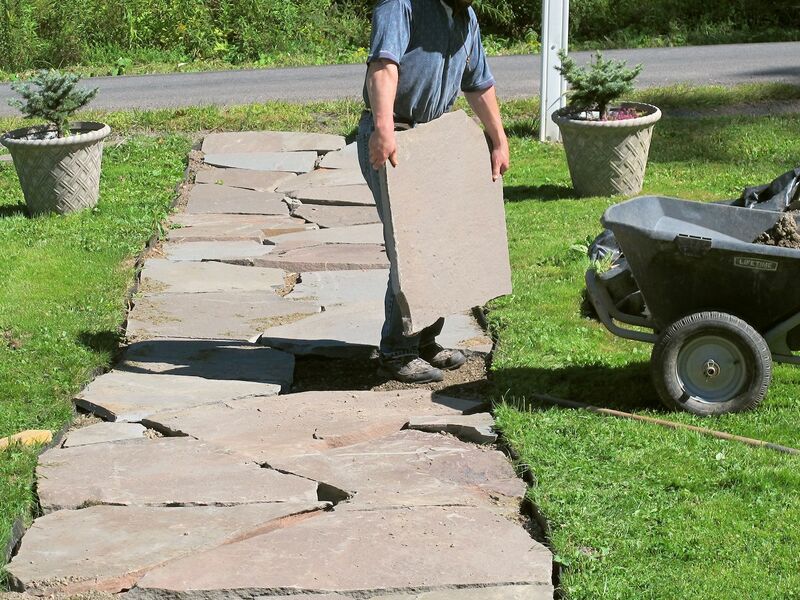 And I think using larger pieces of stone really helps the walk look more solid and inviting, even though they were more work to install.